The latest indicator of surging Indian enrolment in US education comes in the form of the August 2015 SEVIS by the Numbers report from the US government. Combined with data presented via a new interactive mapping tool, the figures show that the number of Indian students in the US grew from 113,649 in July 2014 to 149,999 in July 2015 – for a year-over-year increase of 31.98%. Needless to say, this is an interesting directional indicator of a continued strengthening of Indian student numbers in the US this year. It follows earlier reports from the Council of Graduate Schools, the IIE’s Open Doors, and others that all point to the growing importance of the Indian market as a driver of global mobility. As we have noted earlier, however, the US Student and Exchange Visitor Information System (SEVIS) data provides a distinct view into international enrolment trends in America. The SEVIS system is web-based and its reports are based on real-time data that provides a snapshot of international students in America as of the report date (or at least the previous month). Further, the SEVIS data casts a wider net to provide a more comprehensive view of international enrolment in the US. Open Doors is based on a survey of 3,000 accredited higher education institutions and so the focus is on those enrolled in academic study at US colleges. In contrast, SEVIS data reflects all levels of education, including primary and secondary school enrolments. Keeping that broader view in mind, the SEVIS data indicates a 9.12% increase in international enrolment in the US between July 2014 and July 2015, with key emerging markets, notably India, driving much of that growth. Graduate studies remain the focus for US-bound Indian students this year. Of the students currently enrolled in the US, 113,509 – or 75.7% – are studying at the master’s level (as opposed to only 9.3% in undergraduate programmes). And most Indian students – 81% according to the latest SEVIS report – are enrolled in science, technology, engineering, and math (STEM) subjects. This is by far the largest focus on STEM subjects represented by any national student group in America. In comparison, 38% of all international students in the US were enrolled in STEM programmes as of July 2015. 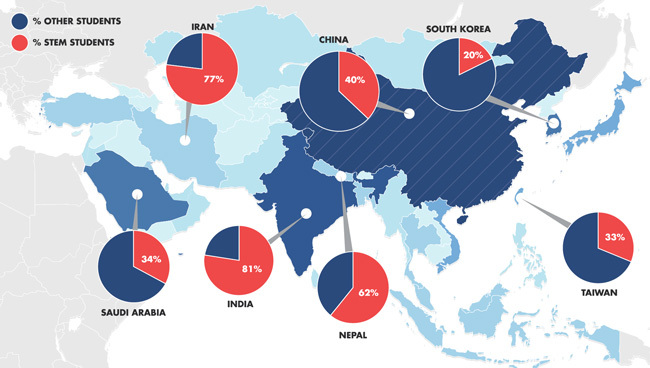 The US relies on Asia for about 76% of its international enrolment base, and those students are slightly over-represented in STEM subjects in that 43% of all Asian students in America are enrolled in STEM programmes. As has been the case for some time, China remains the leading source of international students in the US by a considerable margin. As has also reliably been the case, India is locked in place as the second-largest sending country for the US. The thing that separates the two over the last couple of years is the rate of growth exhibited by each market. Against India’s nearly 32% growth from 2014 to 2015, Chinese enrolment grew by 10.13% over the same period. These contrasting growth rates have been particularly in evidence with respect to graduate programmes in the US. Chinese enrolment in such programmes has been declining since 2012 (alongside a notable shift to undergraduate studies for Chinese students) whereas India has continued to exhibit strong growth. Meanwhile, other reports have also pointed to relatively faster growth in India, with some indicating the overall growth in outbound mobility for India surpassed that of China for the first time last year. As always, factors such as higher education participation rates, domestic higher education capacity, economic growth, and the strength and size of the middle class are among some of the most important predictors of longer-term growth trends for any market. This entry was posted in Asia, Higher Education, India, North America, Regions, Research, United States and tagged student recruitment, higher education statistics, primary schools abroad, international schools, international students. Good to see positive growth.